Cotton has been king in Mississippi since the early 1800s but has seen its reign diminish since the late 1980s. The majestic crop has seen a rise in its ranks with an increase in acres planted the past decade. For the past century, the Chassaniol family of Greenwood has been part of the cotton kingdom and its rise and fall and rise again. 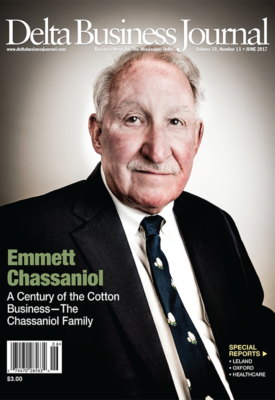 Emmett Chassaniol Jr., still works in the family cotton business his grandfather started in the early 1900s. He explained the family history in the cotton business by gathering correspondence from his grandfather, family input and his own recollection. In 1917, the Chassaniol and Company cotton business opened its doors in the Cotton Capital city when the transplanted cotton shipper Herbert Spencer (H.S.) “Pop” Chassaniol decided to stay in his adopted home town. His original office was on 117 Front street but then he later moved to 110 Main Street—the corner of Ramcat Alley and Main Street in the “Cotton Row” area. He stayed in that building until he retired in 1963 and then he passed away in 1966. In 1968, the family sold the building to Mr. Charles Swayze. In 1956, H.S. recounted his career in a letter he wrote to the vice president of the Hibernia National Bank in New Orleans. H.S. had known the VPs father and uncles in the cotton business in the New Orleans Cotton Exchange. From there Chassaniol worked his way up from the bottom of the cotton business to owning his own cotton business. Emmett’s grandfather was later moved to the Delta in 1910—first to Greenville and then Greenwood with the English firm, Alexander Eccles and Company. But they then decided to close that office and move Chassaniol to Tennessee. But H.S. knew he had found a business home, so he stayed in Greenwood and opened up the Chassaniol and Company cotton business in 1917. The Greenwood Cotton Exchange got its charter in 1927 and H.S. was the first president serving the 1927-1928 term. He later served again from 1940-1941. Since then, H.S.’s sons—Pershing and Emmett (Sr.)—a cotton buyer—each worked the business together before Pershing started his own company—The Pershing Chassaniol Cotton Factor—in 1955 after serving time in World War II. He also served as president of the Greenwood Cotton Exchange for the 1970-1971 term. Pershing was then joined by his nephew Emmett Jr. and Pershing’s daughter, Sally Chassaniol McSpadden. Emmett Jr. served as the Greenwood Cotton Exchange president on three occasions—1992-1993, 1999-2000 and 2006-2007. The Cotton Exchange’s final year of existence was in 2009 and then it was dissolved. One of H.S.’s sons, Herbert Chassaniol, Jr., worked with him in the business until June of 1939, when at the age of 25, he died in a diving accident on the Mississippi Gulf Coast. Also, one of Pop’s sons, Lloyd, worked in the cotton business for different companies but never with Pop. Pershing retired in 1995 and sold his building to Viking Range. Then in January of 1996, Emmett Jr. incorporated his business, Chassaniol and Company and moved into the historic McBee building that dates back to 1880. For more than a century, the Chassaniol family has blessed farmers and the family alike as the Chassaniols kept to the foundational value as stated by Pershing quite often to his daughter. McSpadden, like the rest of the family, grew up in the cotton office as well. With no computers, McSpadden had plenty of paperwork to tend to that she included her children’s help with as well. McSpadden invoiced and paid famers while Emmett graded out and sold the cotton. Three generation of the Chassaniol family have worked with the Bank of Commerce and continue do so today, according to Emmett Jr. The Chassaniols have experienced plenty of technology changes on the cotton selling side as farmers have seen in the field. As field hands used to pick cotton by hand, all of the bookkeeping and cotton samples were all done by hand with what now would seem to be primitive tools. McSpadden’s early days involved two daily trips to the bank with cotton receipts. “I invoiced every bale of cotton. In a year’s time, we’re talking thousands of bales of cotton. In the beginning the receipts were kept at the bank (in the main safe) and every morning we would have to go to the bank and pick up all the cotton receipts and bring them back to the office and I would invoice them out. The ones I didn’t finish with, I had to take back to the bank before they closed at 2:00 p.m.,” she said. But then Pershing got his own safe so his daughter could work a few more hours each day. “That way we couldn’t stop and talk to people on the way to the bank every day,” she said. For Emmett Jr., the introduction of technology made selling cotton a 24/7/365 business pretty much. Chassaniol is gearing up for a busier year this year as more farmers are adding acreage. Chassaniol’s reach extends beyond the Cotton Capital as he’s sold cotton out of Louisiana and Arkansas and in the hills of Mississippi beyond the Delta. As the Chassaniol women married, many of those joined the cotton business including the McCurdy part of the family. McSpadden knows that the kingly crop brought and kept her Chassaniol family close together. With the parents working long hours in the business, they made sure the kids made it to their extracurricular events over the years as well. “They had this older man, Sidney Matlock (a porter who worked in the sample room) started with momma and daddy. He was somebody that was big in our lives. Momma couldn’t get away to take us to Girl Scouts, well they’d send Sidney to take us,” she said. Chassaniol has relied on his secretary, Penny Kesterson for the past 16 years to keep his office a success and running smoothly. 100 years of working in the cotton business with plenty more to come—the Chassaniol family of Greenwood.